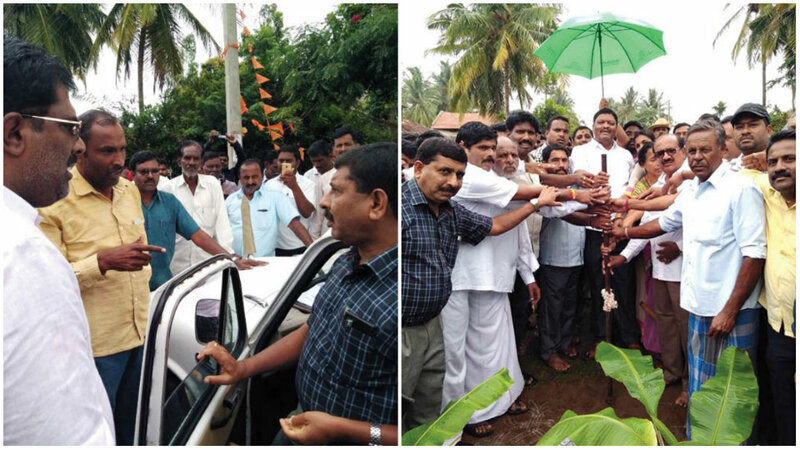 Periyapatna: Even as a Congress-JD(S) coalition government is ruling Karnataka, the followers of former Congress MLA K. Venkatesh staged a demonstration against the move of the newly-elected JD(S) MLA K. Mahadev to lay the foundation stone for Rs.4.75 crore road works in Belathur village here. The agitators gheraoed the car of PWD Assistant Executive Engineer (AEE) S. Prakash and took him to task for allowing MLA Mahadev to once again perform guddali puja (foundation stone) for which the previous MLA had done in the past. They charged that their leader Venkatesh had already got the money sanctioned for the road works and it was wrong on the part of AEE to once again ask the new MLA to do the puja again. They demanded to know who gave him permission to do it and attacked him and his car. Meanwhile, the Police who were present prevented the situation from turning ugly and Prakash was immediately escorted into the waiting car of the MLA. However, Mahadev managed to perform the guddali puja to launch nearly Rs. 25 crore works in the taluk including drainage and foundation stone for Samudaya Bhavan.